Emergency Service - Professional Building Services, Inc.
No one can control when emergencies will happen, but PBS is ready and equipped to respond when they do. 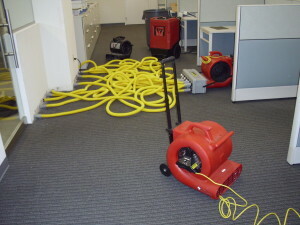 Wind, fire and water damage is never planned, but can be devastating to a business. Professional Building Services, Inc. provides Emergency Response Services 24 hours per day, 7 days per week. Our industry trained technicians are outfitted with state-of-the-art equipment and are knowledgeable in cutting edge restoration techniques. PBS is ready to respond anywhere, anytime for all your real estate emergencies. PBS is also proud to have a strategic alliance with Budget Maintenance Emergency Services (BMES), one of the area’s leading commercial property restoration groups. Through this partnership we are equipped to handle any size project ranging from a plumbing failure to a high-rise sprinkler discharge and more. We are committed to putting you back in business faster, and for less.